Have you been itching for an idea for your next big DIY project? Are you in the market for a new fence or stylish pergola? Look no further! At Mid Atlantic Deck and Fence, we have extensive experience building and installing vinyl pergolas for our customers. But we also know that doing things yourself can be a rewarding and affordable experience, so we want to help you every step of the way. Each vinyl pergola kit is constructed using the most high quality vinyl components available on the market. Each of our kits includes a lifetime manufacturer warranty that protects your material against fading, blistering, yellowing, chalking and cracking for as long as you own your property. The first step in customizing your pergola kit is to decide on the order form if you want a freestanding or attached model. Then you must choose the model and size of your pergola and determine if you’d like stringers attached or not. 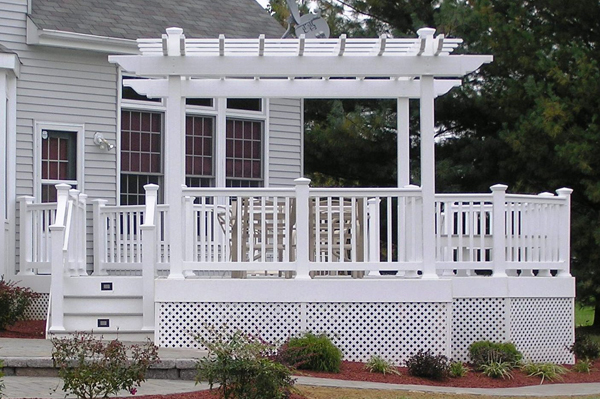 We offer many great vinyl pergola options. The styles you can choose from are called The Annapolitan (attached model), The Chrisfield (freestanding model), The Fenwick (freestanding model), The Rehobeth or The Bethany. Do you like one of these models but find that it’s missing some design element you had hoped for? No problem! If you send us your design idea, we’d love to help modify a custom pergola for you to make sure you are getting the design you’ve been dreaming of. We also offer DIY vinyl railing kits, wood fencing kits, vinyl fencing kits and ornamental aluminum fencing kits. Whatever your vision is, we can help you every step of the way until it becomes a reality. Don’t forget about safety! Please remember to use extreme caution and care when putting your kit together. Are You Ready to Talk to Someone About Your DIY Vinyl Pergola Project?